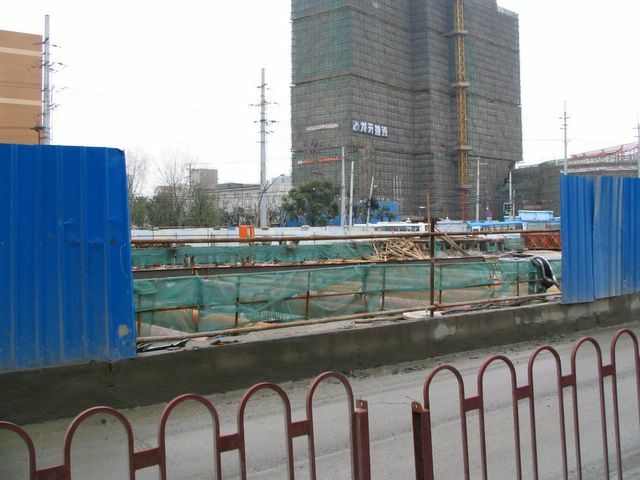 SHANGHAI: the common sight of construction... China's development. 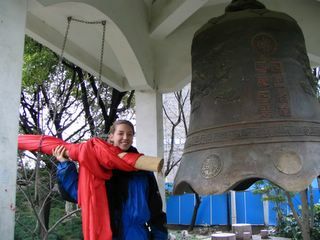 I am beginning to settle into a routine here in Fuzhou, China. 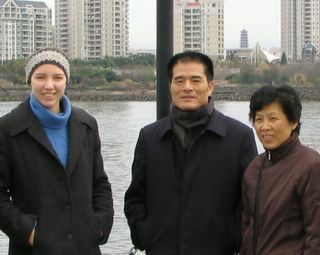 The most important part of my life here is the Zheng family. They have all made me feel very, very welcome. They also want to take very good care of me and are very attentive to anything I might need. I live with Zheng Bai Xin and his wife in a very nice new apartment. I even have internet in my own room. All the furniture, the whole apartment, is much more modern than any place I’ve lived in the US. Of course outside things are not a beautiful as in the US, and outside sometime the poverty is overwhelming, with beggars eating from trash piles, and deformed persons begging for money in the streets. In the mornings I go to Tai Chi class. Then I return home and have a breakfast of sticky rice with tiny shrimps and some other spices. During the day I go to Bai Xin’s work place, where I study Chinese and the famous Chinese Novel Dream of the Red Chamber. He has employed two young women, who help me with the Chinese pinyin and pronunciation. Everyday I read a short story, or a newspaper article, and so slowly build my understanding of China, and simultaneously work on my Chinese. Bai Xin is a very good teacher, and he makes me read loudly and clearly. That comprises about half of the day. The other half of my day is spent at “Lao Jia” – which is my second home base here. It is the home of the mother of the Zhengs. It is also Bai Zhong’s house. Bai Zhong is my painting teacher and I watch him paint for a few hours and then paint for a few hours. My painting is making huge progress everyday, and Bai Zhong is really an excellent, excellent teacher. He presents these big painting challenges, and then gives me a few tries to work it out. Then he gives me instructions on the fundamental philosophies of painting. I am extremely lucky. 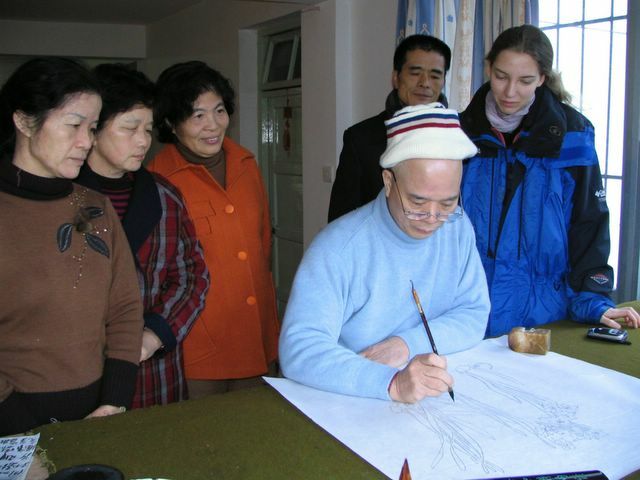 All Bai Zhong’s other students just watch him paint or listen to Bai Zhong’s advice on painting. But he doesn’t teach anyone else how to use the brush. He say’s he teaches me because I have the feeling for painting, and I have the understanding for painting. Lunch and dinner are at Lao Jia, and each meal is a lengthy affair. Dishes keep coming out and coming out, and almost everyday new guests come over and join us. So for now that’s the sketch of my days…..
And now to catch up with past goings on! My hotel was right at the end of Nanjing Lu which is the famous Shanghai outdoor-mall, that has more shops than most US malls. Although the prices are expensive for Chinese standards, they are very cheap for US standards. At night, the whole place is light up with bright signs, in all different colors. The signs are as tall as the ~20 storied buildings (for example one coke sign was flashing in red and white lights in the shape of a coke bottle and was about 15 stories high!). At the end of Nanjing road is the bund, a series of large old European buildings that used to be the foreign embassies or residences of very wealthy folks from European countries. During the day they look a little run down, but at night they are all light up and look impressive! These buildings line the Huangpu River – which is fairly muddy and also has a fair amount of trash floating around in it. On the other side is the skyline of Pudong – the newest section of Shanghai. There are impressive sky scrappers – all glass and steel and the famous “pearl of the orient TV tower”. A trip up to the top of the TV tower provided wonderful views of the Huangpu River and the bund. Inside the tower, many beautiful young women are there to greet you, and they are all dressed in red outfits and speak both English and Chinese. (The Chinese really seem to like outfits. In most malls and businesses, the workers are all provided with outfits.) 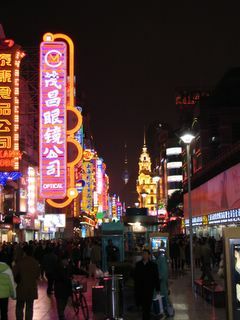 Then there is old town Shanghai. The buildings are the classic old Chinese architecture. It’s obvious that the Chinese themselves aren’t interested much in the architecture, but rather in setting up the hundreds of little shops inside. The temple which is in this old section of the town is filled with what to me were artlessly painted Buddha’s. Of course the temple was absolutely surrounded by shops…. Beyond the tourist zone are large apartment complexes or small streets with laundry hanging out the windows. 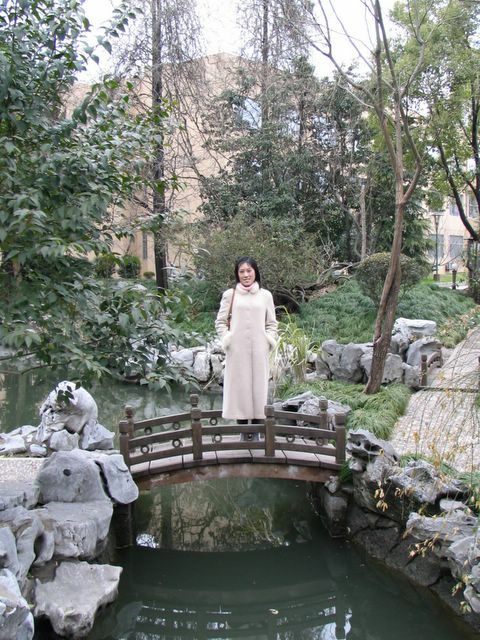 A trip to Fudan University was very interesting. Here was one of the famous Chinese universities and unlike the institutions of learning in the US, aesthetics were obviously not a priority. Probably it has to do with lack of significant funding. The dorms were a fairly deplorable sight, with one room for 6 students to share and absolutely no heating and also no insulation. Throughout Shanghai there are places of massive construction, with roads totally torn up, or buildings that are being torn down. Many of the high-rises have construction rigging around them. The whole place seems to be changing at a very fast rate. It seems in the US it would take us years to accomplish what the Chinese do in a few months. Of course, one wonders at the compromise in quality that occurs when things are changing and being built sooo quickly! Cars running, horns honking, people yelling, and talking are the common sounds of the city. 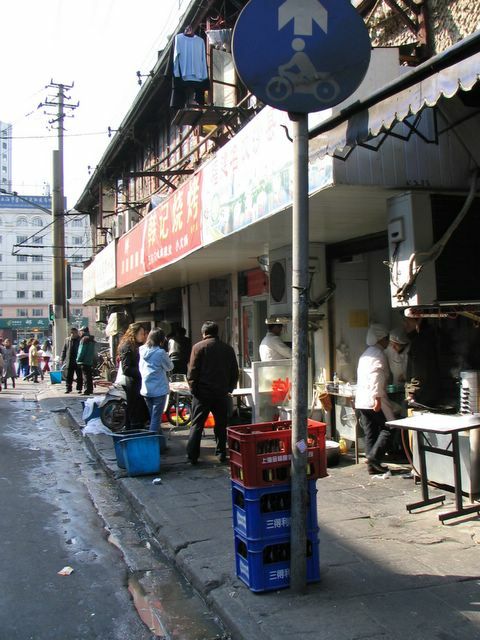 The Chinese seem to have little need to find any quiet places – or at least create public space that is conductive to quiet. They are much more interested in being together and having a good time. The smell of pollution, garbage and dirty water are the main smells. Of course Ge Yukuan my first host, decided that I should have a dramatic eating experience and ordered some chicken-blood soup. I decided to have dinner at one of the famous restaurants (M on the Bund), which turned out to be mainly a European visitors hang out. Certainly the food was interesting and good, but did not meet the standards of some of the better American restaurants. But the view made the trip to the restaurant special. The restaurant is located on the 7th floor of a building directly on the Bund, so it has great views of Pudong. The best dining experience was with Sun Jian (the professor from Fudan University who originally made contact for me with the people in Yunnan university where I at first wanted to teach English). He ordered a Shanghai specialty – squirrel fish, which was by far the most interesting and delicious fish I ever ate in my life! And of course best of all most food costs a few dollars per meal! The celebration of Chinese New Year was full of Family, friends and good food. The night before the start of the new year, the family burned paper money, and paid respects of their father, cooked up a feast and toasted each other, thanked each other for favors exchanged, acknowledged each others debts. 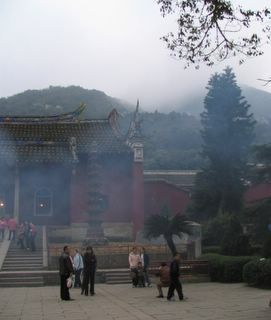 Then the first day of the New Year we visited a nearby temple and burned incense and lit candles. And then spent more time with family and ate more good food. The second day of the New Year I went with Zheng Bai Xin’s wife to her mothers home and played Mahjong and ate more yummy food… The third day I went with Bai Xin and climbed Gu Shan – a mountain here by Fuzhou. I climbed the mountain which was full of people, and visited the beautiful temple at the top. It felt very quiet and peaceful there, and I enjoyed my time there very much. The fourth day I went with Bai Xin to a Banquet, and had more yummy food, and met more wonderful people. 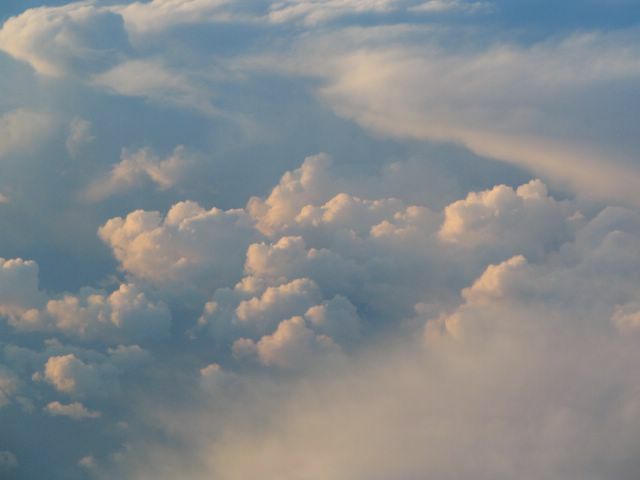 Here are some clouds from the planeride, gateway to dreamland. I have arrived in Shanghai - the modern city of China. But first a few stories of my plane trip. The high-lights were the following: My neighbor - an american businessman told me a great hospital horror story. So a man from the company he works with, was showing off a motorized motor scooter. It malfunctioned on him and drove as fast as it could into a wall. The man hit his head on the wall and had to go to the local hospital (in backcountry China). The doctor was a woman, and as she started to sew up his head she began a lively conversation on her cell phone. Then she began to clear her throat and spit, right on the bed, as she was still sewing up the poor mans head. His wife began to protest, so the doctor took to spitting at the foot of the bed instead.... Poverty and ignorance, wow. On to the other polarity. I wandered the plane which was more than half empty and as I walked through business class a couple of Chinese businessmen got to talking with me. They were the president and vice president of a venture capital company. They soon invited me to sit down with them and they tried to talk me into working for them! We talked about Chinese culture and about how fast everything in China is changing. Naturally they did not express any regret about loss of culture and instead talked about their 12 year old daughter’s special education, where one of the projects was to create a business plan for a fast train between Shanghai and Beijing. So in this experience it was all about – girl, what in the world are you doing studying old Chinese culture? You are wasting your years! Get into doing business! (Ok so not quite that overt… but almost) New China emerges with an eye on the goal – business! Oh – one more thing about the plane ride. We’re about 20 minutes till landing and the stewardesses announce “well be spraying the cabin for any bugs from the US.” My neighbor and I look at each other and go “Oh my God they are going to spray pesticide in the plane while we are still on!” We ask for masks. And in a few minutes the stewardess comes back saying, we don’t have any and see over there, she’s already spraying, and she’s already come by you! See how harmless that was? I guess those stories were awfully pessimistic. At the time it felt like simply experience, nothing good or bad. Everyone was very friendly….